REFLECTION: It is clear that Jesus and the other players are human … but there is no identifiable human trait that stands out. Jesus is everybody. The soldiers here in a row are everybody. And the judgment will be for everybody. The images on side walls of Roman Catholic churches go largely ignored most of the year, hardly getting as much as a glance as people walk down the aisles to their pews. But during the liturgical season of Lent, from Ash Wednesday to Holy Thursday evening as the Mass of the Last Supper begins, and on Good Friday, they become an important form of personal and public devotion. 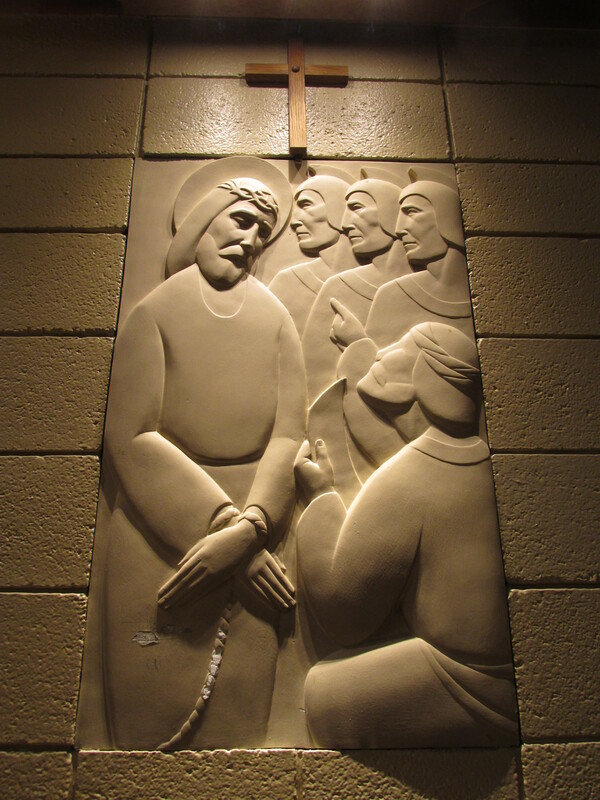 These 14 images are the Stations of the Cross. Most parishes hold these devotional services weekly during Lent; sometime more often in some parishes. At mine, St. Kevin, Welland, they are held Friday evenings. Attendance varies, usually from 50 or 60 to 100 or so. You may recall seeing or reading about high profile public Stations, like those at World Youth Day. When Toronto hosted, in 2002, about 500,00 people watched and prayed in Nathan Phillips Square, along a stretch of University Avenue, in front of the Ontario Legislature building and through Queen’s Park and finally, in front of the Royal Ontario Museum. In Rio de Janeiro in 2013, more than 1 million are said to have witnessed. When I attended a recent weekend retreat, Spirituality of the 12-Step Program at the Jesuit Spiritual Renewal Centre in Pickering, participants were given opportunity to take part in an outdoor Stations of the Cross. It was one of the most emotionally moving that I have seen. REFLECTION: There is resignation on the part of Jesus and determination. This is his hour. He has been waiting for his hour. I can’t really do the stations unless I do them as a disciple. And one can’t really be a disciple unless one takes up that cross and walks it as Jesus did. There is movement here. Jesus walking the cross. The three Roman soldiers right behind him. The invitation here is for me to walk along shouldering my own cross. REFLECTION: Here just Jesus and his mother. Mary is there in her role as mother. And Mary is there in her role as first disciple; first believer. 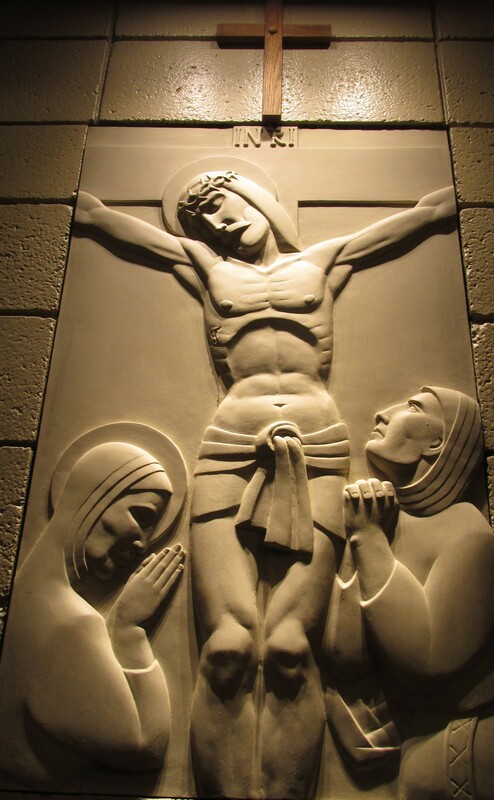 Jesus shoulders the cross with one arm and the other arm directed towards his mother. Mary is kneeling her arms outstretched. Is she there to catch or embrace Jesus? Or is she there to let Jesus go – to encourage Jesus so that he can do what his Father wanted him to do? The idea of a mother and child – roots and wings. There is time to hold and embrace and give security. And there is a time to let go as the bird flees the next. In Mary’s posture she does both. 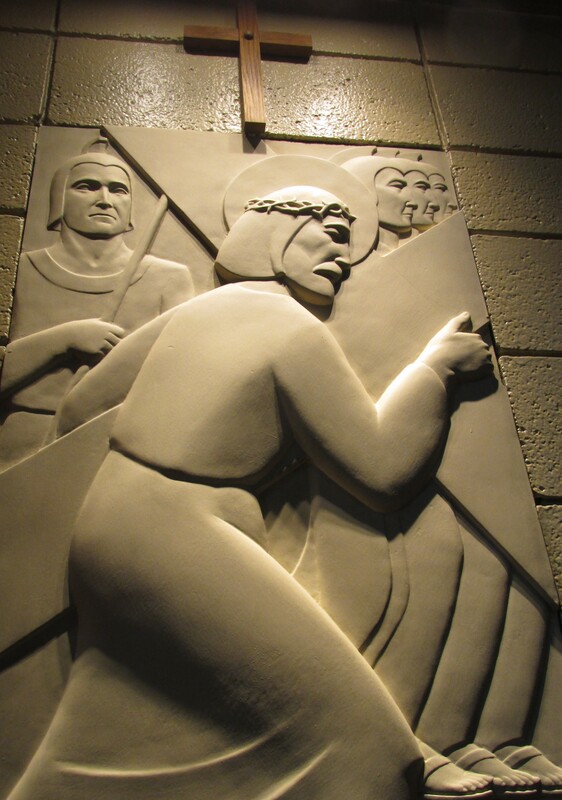 I often wondered about the Stations in my parish: who was the artist, where did they come from? With the assistance of office staffer Marney Donohue, on Friday I learned a little more about them. The Stations are the work of Niagara Falls sculptor Helen Waimel Robertson. 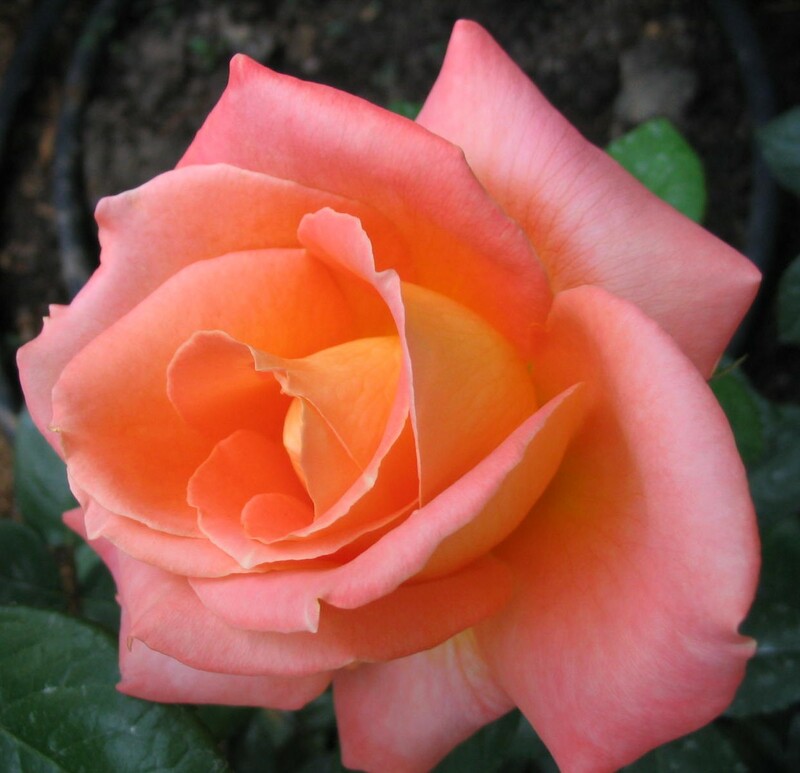 She was born in Estonia in 1917, emigrated to Canada in 1926 and died May 22, 2002. In 2006, her name was added as an inductee on the Niagara Falls Arts and Culture Wall of Fame. Mrs. Robertson attended the prestigious Ontario College of Art in Toronto on a scholarship, completing a four-year program in three. She was awarded the Governor General’s Gold Medal upon graduation. According to information in her death notice, she made “a considerable contribution to the sculptor scene in Canada.” Her commissions included 12 Canada Coats of Arms, 10 Provincial Coats of Arms, Shields of Arms for Ontario Law Courts for various cities, architectural and ornamental sculpture for the Workmans Compensation Rehabilitation Centre, the crest for Niagara Falls City Hall and of course, the Stations of the Cross at St. Kevin, among others. REFLECTION:This group of five persons, Jesus, two women and two children, is a powerful indictment of the patriarchal clericalism that there is still too much of in the church. No men here crying for or supporting Jesus. And I apply this to today. In most parishes in most places in the world it is the women who are the mainstays. It is the women who by and large make up the worshipping church, the witnessing church and the serving church. It is the absence of women in the offices where the rules and regulations and decisions are made that is missed most. The two women and the two children here jump out at us demonstrating what discipleship means in action. Whether one is spiritual or not, Mrs. Robertson’s Stations of the Cross are noteworthy for simple elegance yet powerful imagery combining to create a masterful piece of religious art. They can’t be looked at for only a few seconds without inviting a longer and deeper, more probing study by the eye. These striking images may very well be the least known art treasure in the City of Welland. At. 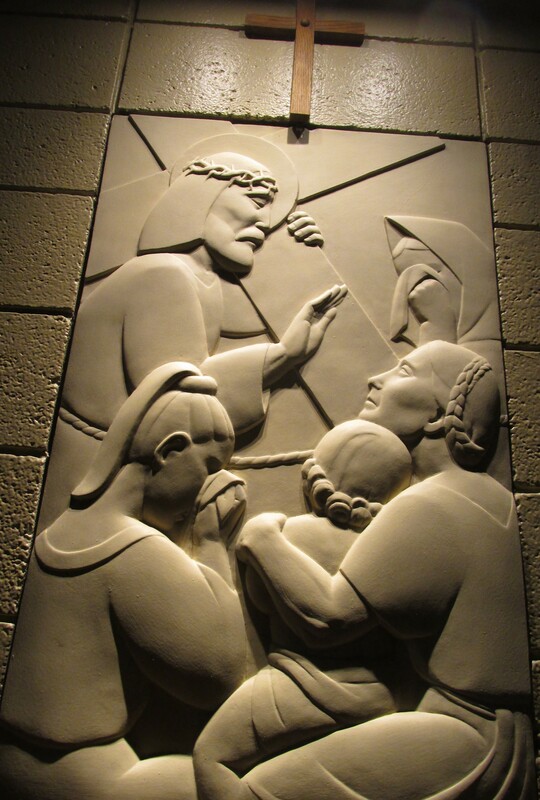 St. Kevin, various groups or ministries take turns hosting each of the Stations of the Cross evenings, for example: St. Vincent de Paul Society, Youth Ministry, Franciscan Fraternity, Social Justice, Holy Cross Fathers. I asked Father Jim Mulligan CSC, associate pastor at St. Kevin to offer reflections for some of the Stations. I have used his text (in italics beneath the photos) with some of the photos I have taken, and one photo, above, appears as a stand alone image in this piece of work. “I have always liked the stations here at the church. They are almost in the style of an icon. They are carved stone. Each figure is in relief,” Mulligan noted. 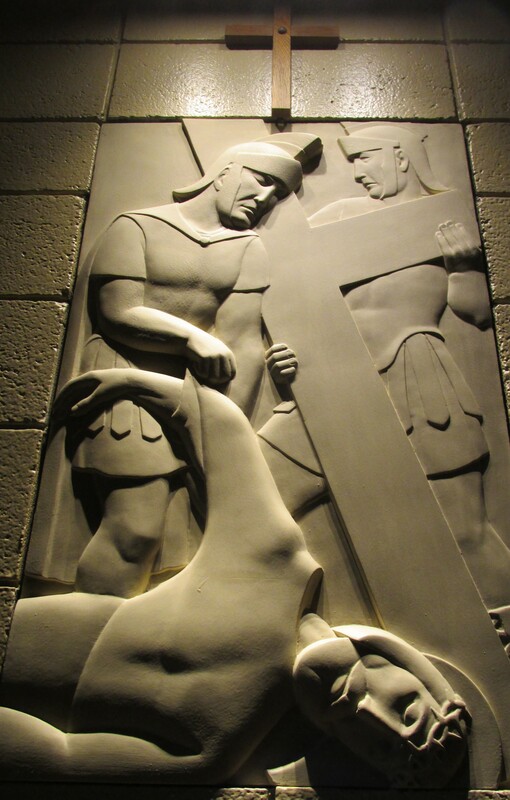 Twelfth Station – Jesus dies on the cross. REFLECTION: Jesus dying. Jesus dead. His mother. The disciple. Jesus gives the disciple (the church) into the care of his mother. Jesus gives his mother into the care of the disciple. Really – there are two disciples. Mary is the first of all of the disciples. She is discipling here trying to absorb what is beyond all of comprehension – the horrendous death of her son, her son who is Emmanuel, God with us. Disciples are often called to accept that which is total mystery and to accept it on faith. This station always reminds me of that. 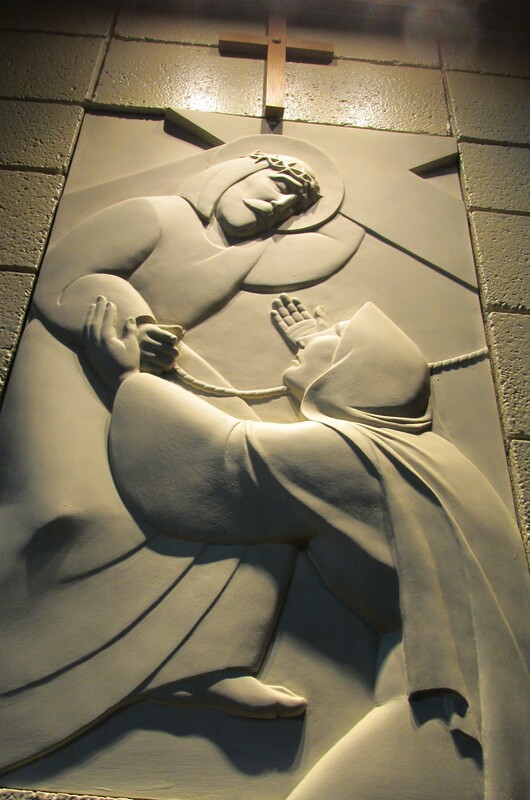 The disciple looking up to Jesus; Mary head bowed and hands folded asking for the grace of acceptance; asking that her beloved son – no matter what, is safe and at peace, finally. This station reminds me too of the hole in Jesus’ side from which came water and blood, the water of baptism and our birth into new life and the blood of the Eucharist that is food for our journey in our discipling and in our living this new life. The death of Jesus gives new life in abundance. The 14 Stations are listed below as is the 15th which was more recently added. Friday April 18, Good Friday, 7 p.m., a live re-enactment of the Stations by drama students from Notre Dame College School. This entry was posted in Uncategorized on April 5, 2014 by fromareportersnotebook.